Budo taijutsu can be translated as “warrior body movement art.” On a physical level, it is efficient and effective movement using counter intuitive yet simple principles. On a spiritual level, training in budo taijutsu allows us to rise above the destructiveness of fear. One of the paradoxes of budo taijutsu training is that letting go of the need to win, to crush the attacker, is much more effective than relying on anger fueled by fear. Many martial arts are really sports that demand the practitioner use a combination of fitness and ferocity to overcome larger attackers. These confrontations, already a challenge for a smaller person, are objectively more difficult as the body ages and fitness fades. Street survival based on fitness is doomed by time to fail. More importantly, constant ferocity, aggression and fear of others are spiritually self-destructive. That which we project out to others, we also project inward toward ourselves. By placing all others in the “potential threat” category, we dehumanize them, destroying the emotional connections essential for our own well-being. That dehumanization, taken to the extreme, is one of the sources of PTSD. In budo taijutsu, learning to trust those efficient and effective movements requires us to let go of fear, which in turn creates even more efficient and effective movement. As a result, the practitioner begins by learning to protect himself against physical attack but ends by protecting himself from the spiritual damage of his own fear. This is only possible when the heart, the technique and the body harmoniously connect. Hence, the name James Morganelli, our Dojo Cho, chose for the dojo: shin gi tai ichi. 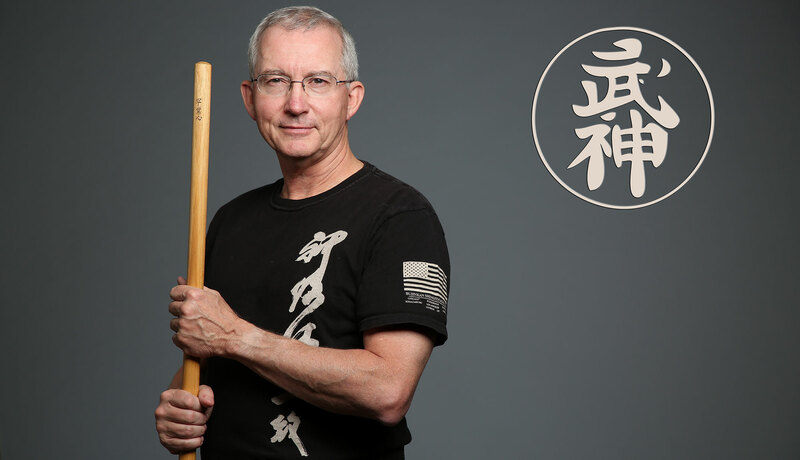 The Shingitai Ichi Dojo, led by Shidoshi and Dojo Cho James Morganelli, embodies the focus on protection taught by the founder of the Bujinkan, Masaaki Hatsumi and his teacher, Toshisugu Takamatsu. As the practitioner’s skill increases, we strive to protect first ourselves, then those around us, and, ultimately, the attacker. More information about James Morganelli and the umbrella Shingitai Ichi Dojo he leads is available at www.sgtidojo.org. Charlie Harrison began martial arts training in 1972 at age 15, alongside servicemen at Charleston Air Force Base in South Carolina. He holds black belt ranking in Tae Kwon Do and Shorin Ryu Karate and has also trained in boxing, kick boxing, escrima and aikido. He has been a member of the Bujinkan Shingitai-Ichi Dojo since 2008. In 2016, he traveled to Japan, passed the Go-Dan test and received his teaching license. Charlie teaches in the greater Elgin, Illinois area and can be reached using the contact form by clicking here. Please send a brief sports or martial arts bio and why you wish to train in Budo Taijutsu. A number of James Morganelli’s students have traveled to Japan, passed the Go-Dan test and are licensed to teach budo taijutsu in the Bujinkan. They can be found at www.sgtidojo.org under Instructors. If you wish to train with any of them you may send an inquiry to the appropriate instructor with a few sentences describing your martial arts bio and why you wish to train in budo taijutsu.